Dr. Siegel and her knowledgeable, caring staff look forward to working with you to ensure your child’s experience with us is positive. Please take a moment to complete the new patient form below prior to your visit. If you have any questions prior to your visit, please call our office and a member of our Special Smiles staff would be happy to assist you. When confirming your child’s appointment, please let us know if there are special accommodations needed. Remember to bring all insurance documents to your appointment. At Special Smiles, we believe communication with our patients and parents is every important. We will never recommend treatment that we would not accept for our own children. We strive each day to treat your children as if they were our own. We value honesty and integrity in all that we do and treat each patient with kindness and respect. From the East – Take 465 W. Take exit 27 (Michigan Rd). Turn right on Michigan Rd. Our office will be on the right after W 106th St.
From the West – Take 465 E. Take exit 27 (Michigan Rd). Turn left on Michigan Rd. Our office will be on the right after W 106th St. Please complete and submit the new patient form below prior to your visit. Our online form is secure and information provided will remain confidential. 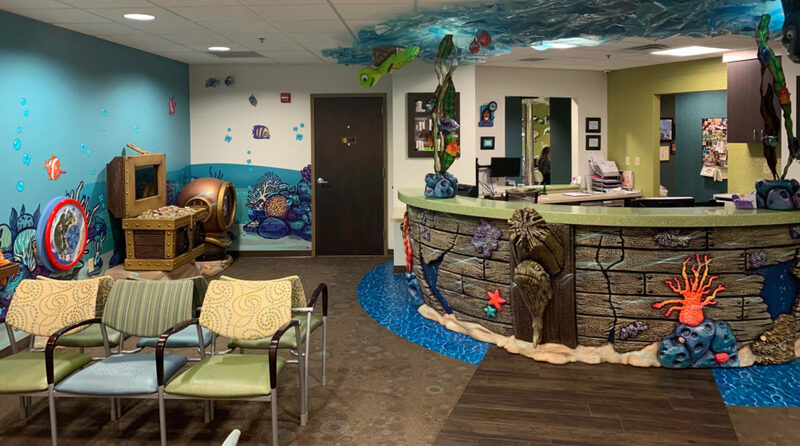 As a courtesy, Special Smiles Pediatric Dentistry will file your primary insurance benefits and our staff will provide you with an estimate of any recommended treatment plan. Our office accepts most insurance plans and we are in network with Delta Dental (Premier), Cigna, Aetna and most Anthem plans. Not a Cardholder? Apply for a CareCredit today! During this visit, we will spend time getting to know you and your child. Please arrive 15 minutes prior to your appointment time to complete any necessary forms. The visit will begin with a tour of our lobby where your child will get acquainted with our video games and television. The tour also includes a stop in our parent waiting area, equipped with coffee, sofa and Wi-Fi access. Collecting updated X-rays, medical history and current oral habits are also included in this visit. Special time will be allowed to familiarize you and your child with our exam area. Once a comfort level is established, your child will have a dental exam followed by a unique welcome by Dr. Siegel! There will also be a photo celebrating your child’s success at the dentist.